Located in the nation’s capital, the Verizon Center is the home of the Washington Wizards. The Wizards have been part of Washington DC’s sports scene since 1973 after moving from Baltimore. Once moving to DC the team, originally known as the Bullets played at the Capital Center, a 18,000 seat facility for 24 seasons. Located in Landover, MD by the 1990s the Bullets and the Washington Capitals (NHL) who shared the Capital Center wanted a new state of the art arena built in Washington DC. Construction began in October 1995 and the $260 million facility was financed using private loans. MCI Communications bought the naming rights to the arena, thus it was originally known as the MCI Center. In 2006 the MCI Center was renamed the Verizon Center after Verizon acquired MCI Communications. Not only did the team move into a new arena in 1997, they changed their name from the Washington Bullets to the Wizards. On December 2, 1997, the Wizards played their first game at the Verizon Center against the Seattle Supersonics. 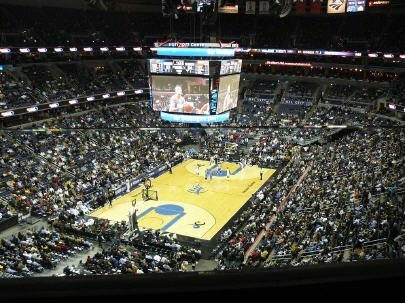 Located in Chinatown, the Verizon Center has a seating capacity of 20,173 that includes 110 luxury suites, six executive suites and 3,000 club seats. Fans attending games can visit the Sports Gallery and Hall of Fame to check out basketball memorabilia. The Verizon Center has several amenities including the Acla Club Restaurant, Johnnie Walker Coaches Club and the Dewar’s 12 Clubhouse. Not only is the Verizon Center home of the Wizards but is home to the Washington Capitals (NHL) and many other events.